Roger Thornhill: Now you listen to me, I’m an advertising man, not a red herring. I’ve got a job, a secretary, a mother, two ex-wives and several bartenders that depend upon me, and I don’t intend to disappoint them all by getting myself “slightly” killed. 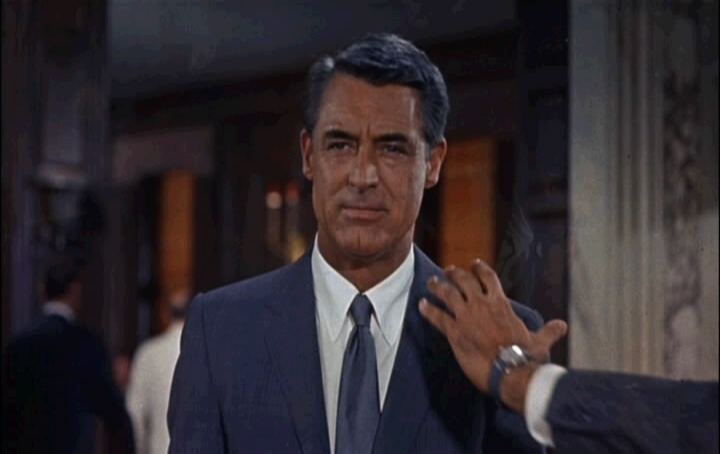 Cary Grant is widely regarded as the best dressed man of the 20th century, and if you watch North By Northwest it wont be difficult to figure out why (the suit Grant wears in the films has been called “the greatest suit in the history of film”). But he does more than just look the part in this movie, he does what was so characteristic of Grant: he makes himself relatable. Grant plays the part of advertising man turned falsely accused murderer, Roger O. Thornhill. It’s what is now a “textbook plot:” A man finds himself mistaken for another person and tries desperately to, not only clear his name, but also to figure out why he was involved in the first place. Grant’s wonderful performance makes you feel as though you yourself are trying to clear YOUR name! 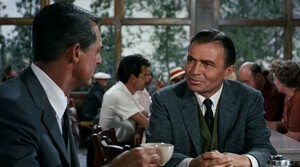 Hitchcock and Grant work beautifully together, as is evident in the film’s ability to combine emotion and suspense in what becomes a very engaging experience. Thornhill eventually finds himself free of his abductors, but is stricken with curiosity about the true identity of Kaplan. Thornhill masquerades as Kaplan to gain access to his room and other personal belongings. This decision only puts him in deeper trouble as he is essentially admitting that he is Kaplan. This film takes us on a wild, gripping adventure (and takes Thornhill to the brink of death numerous times). One of the most memorable near-death experiences that Thornhill faces is when he is attacked by a crop duster. The sheer creativity of the scene is one thing; let alone how magnificently it is captured on film. Along his journey to find the truth, Thornhill falls for double (or maybe triple…?) agent Eve Kendall (Eva Marie Saint). Saint’s character is a powerfully manipulative and emotionally fragile woman who effectively seduces the bejesus out of Thornhill. The two exchange many sensual encounters that are sprinkled with dangerously risqué innuendos. In doing so, Thornhill acquires an emotional attachment to the situation (as if it couldn’t get any worse for the guy!). One of the greatest things about North By Northwest is the way that the music compliments the feeling of the picture. The sweeping tune that is repeated throughout differs only in its volume and tone (to mimic the intensity of the scene). This trait allows the music to take the proper amount of attention at any given time. 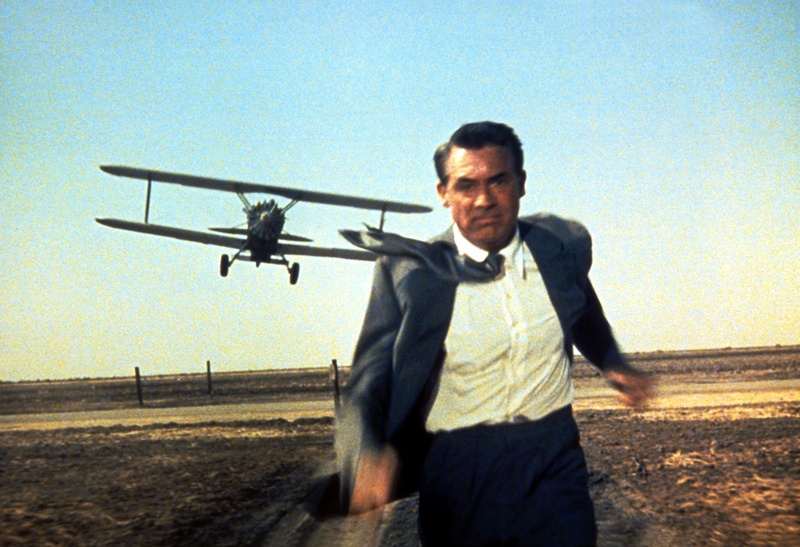 North By Northwest is one of my favorite films; one I have seen at least five times. That fact says a lot, as I generally don’t like to re-watch films when I can watch something I haven’t yet seen. Such is the power of the Hitchcock-Grant collective. Each time I watch it I pick up on different cues, so much so that it sometimes seems as if it were a completely different film. North By Northwest combines so many of the different genres of film that it can be enjoyed by everyone. I highly recommend it to those looking for a great example of what classic films have to offer. I love North by Northwest. Hitchcock and Grant at their finest.